One day after my kids began complaining about how they had to wait a few minutes for “Netflix” to load, and I looked over and thought to myself how spoiled we have become. I thought about how instant gratification is now the norm. (I’m sure this is how most “Back in my day…” stories begin), but I told them about how when I was growing up, we had to hope a cartoon would be on television or had to go to the store to rent a movie. They looked unimpressed as I explained how people used to chop tinder for their wood stoves to cook their food. The more I talked to them about how easy things are for us now, the more I felt convicted by handing them everything on a silver platter and I wanted to show them how things used to be handmade and carefully crafted. Granted I do not have a woodstove and would have no idea how to use one properly, but I began to challenge myself to try to do things the “hard way.” I tried all sorts of projects that I had never done before and even though I didn’t go full out in full pioneer mode, I’m glad that I sought to do things with an old fashioned spirit. Below are the things I tried, I hope they will inspire you to do something old school because studies have shown that learning new things can help keep minds active. Homemade tortillas were easier to make than I thought and are now a regular favorite at my dinner table. 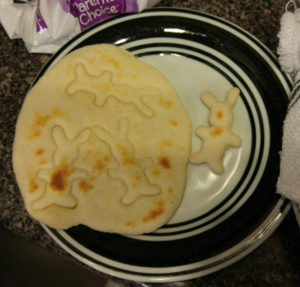 The rabbit shapes were added to my girl’s tortillas just for fun touch before I cooked them. I am not a good cook. My husband would be happy to elaborate on some of my cooking disasters, such as my attempt at hash browns, which turned out gray, my purple pinto beans and mistakenly thinking that vanilla extract could be used for a sauce, but I was going to learn how to make homemade bread, gosh durn it! I turned on “Alton Brown,” one of my favorite cooking shows (my kids love to watch his funny antics too. ), and began cooking. It took a while, but soon my husband was extremely satisfied to have warm homemade bread waiting on the table for dinner. I had tried sewing my husband a blanket a long time ago, it was not the prettiest thing in the world, but it could be considered a quilt, but this time I wanted to make beautiful quilts for each of my girls. I am about as much of a beginner at sewing as you can get. However, I wanted to show my girls how in the past, to make a quilt, the fabric was picked out, cut into pieces and sewn by a pattern. I used a sewing machine, but it’s still the thought that counts. It was fun letting my daughter help design her quilt, count the squares, and measure pattern pieces. I can’t give out a pattern number because I just made up the design as I went along. I had a 6 1/2 x 6 1/2 inch quilting square (obviously) , so I used it to cut out the squares with a rotary cutter. The borders were 2 1/2 X 6 1/2 inches and the small squares were 2 1/2 X 2 1/2. I don’t know if there is a better way to sew it, but I sewed the pieces into rows first and then sewed all the rows together. After I pinned the fuzzy blanket, the batting, and the finished quilt design together. Another old school project I attempted was growing a garden. My husband and I started a garden after our first daughter was born so that she could learn about plants and the process of growing food. The berries were plentiful, and my rhubarb plant I inherited from my dad was enormous, but we added potatoes, artichoke, pinto beans, bell peppers, along with more fruits and veggies to our list of homegrown food. My girls are now learning to recognize leaves and understand which plants are poisonous or edible.While some plants never prospered and I had to learn some hard lessons (like cabbage moths can cause more damage than I would have anticipated), gardening was still one of my most rewarding projects. Pickles proved to be my biggest challenge, because if not preserved properly, they can make a person sick or even kill them, so I opted for the fridge version, just in case. I still attempted the canning process, which was more confusing than I anticipated and I stunk up my whole house, but afterward, we had delicious homemade pickles from the cucumbers grown in our garden. 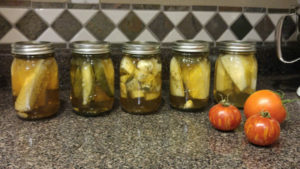 This was the pickle making recipe that I used: http://www.epicurious.com/recipes/food/views/fast-favorite-garlic-dill-pickles-230707 . I also watched Alton Browns pickle making episode a few times. It was very helpful. Making homemade jam was much easier than I thought and more delicious to boot. 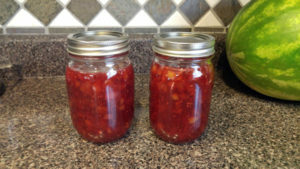 We wanted to make strawberry-rhubarb jam. My daughter was able to clean and chop the berries with a butter knife. We didn’t grow nearly enough strawberries in ourselves and had to buy them, but the rhubarb was homegrown. If anyone is inspired to try any of the things that I have listed, I hope this one tops the list. After seeing people make dresses on Youtube out of a sock some mesh and an old t-shirt, I figured, how hard can it be? Apparently, it is much harder than I thought. 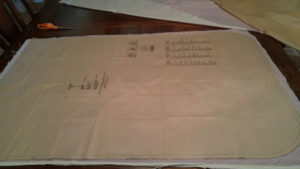 I opened a dress pattern to see words like the fold on the bias, selvage, among other foreign sewing phrases. What? I was ashamed to be so clueless about clothing creation, but after a bit of practice, I not only made my daughter a dress but sewed pajama pants for my whole family. I hope after these experiments, my daughters will understand all the work that goes into the food and material goods they have. Although it is convenient to be able to acquire things quickly, it was fun to spend time creating things from scratch and learning more about them and the process involved. I would love to hear how you have challenged yourself to create something homemade for the first time and how you included your kids. 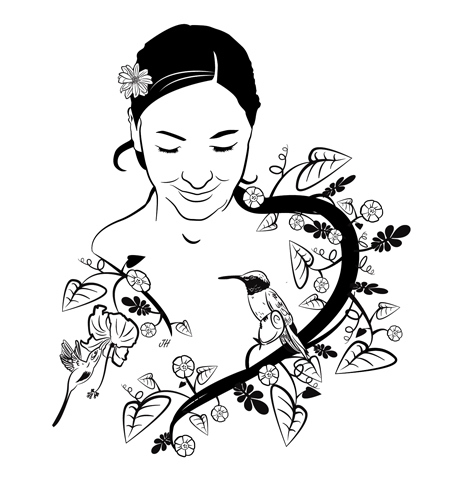 You can leave your comments or suggestions for new projects below in the comment box. Wow! You are one amazing mom! Your daughters and husband are so blessed! I personally make homemade tortillas and most dinners from scratch….I’ve planted many a garden and have helped build walls and roofed a house. I’m in the process of learning how to wire a house and just doing things that are out of my comfort zone just because it makes me appreciate the accomplishments of others and it also gives me a sense of satisfaction. I hope more people will give this a try! There IS a feeling of gratitude toward our ancestors that experimented and made our lives a little/alot simpler! LIFE IS GOOD! Thank you so much, I try really hard to be a good mom. It’s awesome that you are trying to learn so many new things. I want the girls to know they are blessed and GRATITUDE is something they definitely need to have.